it's that time of year for stocktaking. last year at this time, i realized that i was answering to my fourth boss in three and a half years and that i didn't have the energy for the starting all over that that promised. each one came in and wanted to undo everything the previous one had thought was ok in order to leave his mark, so it was an endless cycle of defending the projects one was already doing. and i realized it was no longer worth it to my sanity. and so i'm no longer there. and it has taken me nearly this entire year to recover psychologically, but i do feel that i have at last recovered and found my way back to myself, strong and whole and probably better and stronger and more sure of what makes me tick than i was before. so that makes stocktaking feel like a good and worthy activity, so although i'm not really a big advocate of new year's resolutions, it seems worthwhile to think about what one wants going forward into the new year. yesterday, i had a two hour brainstorming session with two very brilliant and wacky minds. these two people get more ideas every minute than you can imagine and i am always in awe when i'm around them. i feel that i am also a person who gets a lot of ideas, but i could tell that spending a couple of hours brainstorming with them yesterday was the most productive and energizing time i've spent in ages. and i realize that although working mostly from home over the past year has been a true luxury, it has been a bit isolating at times and isolation can be stifling to ideas. you need other people around who stimulate you creatively. your own ideas become better when you bounce them off of the ideas of others. so one of the things i resolve to do in 2009 is to regularly spend time with creative minds who push my thinking in new and exciting directions. this morning, i sat with my newspapers and a cup of tea and read headline upon headline about the financial crisis and how it's starting to impact businesses and individuals. when i walk around on the pedestrian shopping zone in my little town, i see little evidence of any christmas slowdown. people appear to be hurrying around, shopping their little brains out, with that slightly panicked glazed-over look in their eyes, grabbing another and another and another gift. and i realize that i really don't want to do that anymore. it doesn't make us feel good, so why is it that we are driven to consume? last night, i downloaded and read from cover to cover the latest issue of mankind mag. it's a free download from design for mankind and i thought it was so awesome that i went back and donated to it. completely in tune with the zeitgeist, it's the consumption issue. erin talks to artists all over the world about consumption. even before i opened it, i thought of an artist i'd seen on etsy who made daily drawings of the things she bought. and i was delighted to find that she was there in this issue--kate bingaman burt. and because i'd lost track of her after stumbling onto her on etsy months ago, i have now bookmarked her blog. so i hereby resolve to document my purchases, on a daily basis, for at least the whole month of january. perhaps it will be so much fun (or so shocking) that i will continue. but i've been talking about off and on during 2008 that i want to be more conscious about my consumption and now it's time to do something about it. i actually tried keeping a food journal at the beginning of the year, in order to be more conscious about what i was eating, but somehow it didn't catch on with me and it's lying mostly empty by my bedside. 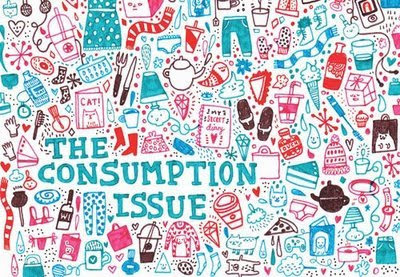 the cover above features a drawing of purchases by UK artist gemma correll that's amazing and inspiring as well, so i think i'll be able to stick with this resolution this time around. and, i'll leave you with erin's challenge from her editor's note in mankind mag--"every time you spend money, you are casting a vote for the kind of world you want." --anna lappe. then erin asks, "have you checked your vote lately?" i for one will be checking my vote a lot more often. just stumbled onto an interesting blog entry and song demo by suzanne vega on the NYT website. check out her song, it's very timely (tho' completely unrelated to what i've written above, just had to share because it was cool). Thanks once again for making me think!! oh julie-- thanks for this wonderful post. i'm so heartened to hear that people are taking the issue of consumption as seriously as it should be taken! erin--you're very welcome. i had to share with everyone i know, it's SO important!! I hope I am not one of those bloggers that annoy you....I am not as well written as so many blogs out there but I hope you see some of the humor in my entries. I don't say much, just post pictures and my family and friends can be updated as to what we are doing.. I love your blog as it is interesting and humourous also. I too agree that consumption is so overdone these days. I am a downsizer myself. I don't like a lot of stuff around. del--you are most DEFINITELY NOT one of the annoying bloggers. they don't visit me at all, so that's why i felt free to say that. I'm always resolving to consume less and then always failing at that resolution. But I like to tell myself that even the time I was being better about it was worth something. Good luck with your consumption goals. Julie - First let me say I LOVE your festive new header, and I don't even drink! But back when I did, vodka always treated me kindly. And re: the consumption issue. It makes me crazy because I just want stuff. No reason, no need - I just want it. (Luckily I am financially forced to say no most of the time.) But on the other side of the coin, i worry that people will lose jobs if we slow down our buying. Sucky, sucky, because I agree with you, but I worry. If people stopped buying school pictures, I'd be out of a job, with a photo lab & business worth nothing. Sometimes I HATE seeing both sides of things. In the meantime, I just buy art supplies & Coca-Colas. It's all been said in previous comments, so I won't repeat it. But, this is a terrific though-provoking post. Thanks for all your insight and abilities to be able to write this down on paper. Julie, I enjoy your blog so very much. You always make me think long and hard about the issues you write about. :) :)...I think this will be a fun experiment...I can't wait to see what you find. Sometimes I think I am really losing my mind. I read a post, craft a whole comment/reply to you and then come back here and see that it doesn't exist. I think the reason for it is that you write so well and in my mind I'm saying "yeah, that's what I think too" so part of me gets distracted and forgets to write the comment. You should take that as a compliment. As someone who grew up with scant holiday traditions (was only in it for the presents, basically) and now as a quasi-adult who doesn't have a holiday tradition, this year especially has made me examine why I buy presents and what I get suckered into. I mean, if I want to give someone a gift, I will do it regardless of the time of year. Right now in SF, the stores are bursting with sales and no one is shopping. It makes me realize too that in this time of great economic uncertainty, that most of us already have what we need and turning our attention to those who do not makes a lot more sense. To me, at least. And about the blog list editing, I hear you on that. I need to revisit my list, too. Thanks for reminding me-- even blogs need a little cleaning up once in a while. Kate B is my Teacher! I take classes from her her at Portland State! She Rocks!